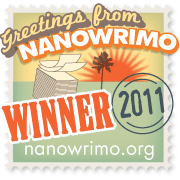 Here, I provide, for amusement and educational purposes only, links to the efforts of my past NaNoWriMo participation. Keep in mind that these are rough drafts, rough outlines of stories that were written during a mad scramble each November. NaNoWriMo emphasizes quantity over quality and that should certainly shine through in each of these documents. Read them at your own risk. The documents are all in PDF format for your reading pleasure. 2002 – Narrative Voices – My first NaNo. The idea was this: What if a schizophrenic justified all the voices he heard by talking on his cell phone. Or pretending to talk on his cell phone. Or some such nonsense. It started with the idea of someone telling the narrator to kill his parents (thus the first line of the story proper.) This document contains an “introduction” in which I try to justify the whole thing. It turned largely into a personal narrative with tangents and rants all based on whatever it was I was thinking about back then. 2003 – Diamonds in the Surf – To this day, I think that this is my most successful story of the lot. It’s not all that successful. But, it does hold together — the plotline follows through, even if the ending is a letdown. I’d always wanted to write a novel based on the Baywatch world because whether or not it intended to, Baywatch contained some of the most amazing absurdist humor I’ve ever seen on television. There actually are Baywatch novels (mostly novelizations of teleplays) and they are pretty brilliant as well. 2006 – Illinoir – Based on a dream I’d had and a title/character (Illinoir – Lord of the Dark State) I’d invented way back in college, Illinoir was supposed to be a murder mystery story. I discovered I’m not so good at writing mysteries. It was a great excuse to read a lot of Chandler, and watch The Thin Man and that alone was worth it. I just read Shutter Island and that book succeeds where I did not — the deluded man investigating his wife’s murder. So much better. But, at least I know I was onto something. 2008 – An Untitled Abraham Lincoln Novel – I had the idea for this while riding in the car with my mom out in Richland, Washington. I think the idea was something along the lines of, “What if there was a shadowy cabal that was behind Lincoln’s ascension to power?” or something along those lines. In the car, and at that moment, it seemed like a great idea. It didn’t hold up all that well, but I did learn a whole lot about Kate Warne which was pretty cool. Also discovered that writing historical fiction is good for a couple reasons: When you’re stuck, you can just look on Wikipedia for some event relating to the times and integrate that. It’s an instant idea repository. Also, people talked more formally back then, so you can eliminate contractions and make speech flowery and that means extra words. And that’s important. Through a total screw up on my part, Mom didn’t know I was doing NaNo this year until I told her mid-December, which led to me not getting her comments and support and notes throughout and afterwards, and that was a serious bummer. 2009 – Dewey & Decimal – Talking with Halsted about…something…lead me to say “that’s the best pairing since Dewey met Decimal” or something like that. And that, of course, brought me to researching Melville Dewey. He was a librarian, and a reformer, and interested in a lot of things. When I found out he was an anti-Semite, I couldn’t help but write about him. Again, the historical figure aspect really helped. Also, just like Narrative Voices and Illinoir, I resorted to the “imaginary friend” theme. 2010 – Brood – The first of two zombie stories in a row. This was a reboot of the idea that was going to fuel Nano2004, but I just couldn’t bring myself to face the late nights and horrible feelings having just moved back to Chicago from New Jersey. Decided to forget about it a couple thousand words in. And so, I brought it back for 2010. The original idea concerned a man who took photos for a housewares company receiving what he thinks to be the Platonic ideal housewares sample, and going on a quest to China to figure out what it all means. This happened instead. 2011 – Me Talk Zombie Someday – Almost stopped 1.5 weeks into 2010 so I could start over and write 2010 as this: a zombie with the power of narrative thought. This is the story of the zombie apocalypse, mostly told through flashbacks, all from the point of view of one of the shambling undead. Best moments of the writing process took place when the things I randomly chose to begin the zombie apocalypse turned out to be entirely feasible when I researched after the fact. Other than that? Not a whole lot. i did nanowrimo last year .during midterms and finals .it was insane i was insane but i was glad i did it except i haven t looked at the story since .it makes me nervous .